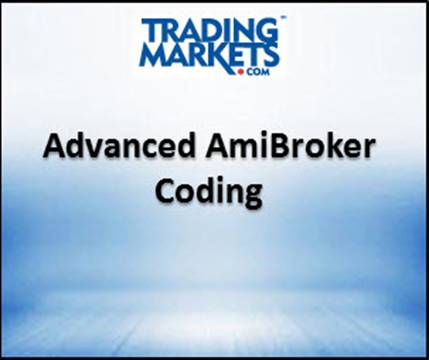 , Director Of Research for Connors Research is teaching the same AmiBroker programming techniques Connors Research uses in order to create and build high performing strategies. By the end of this course, you will have the ability to do your own high grade testing and analysis that so many professional traders rely upon to improve their trading and investing returns. •Determine when to use each of the three levels of the Custom Backtester. Within minutes customize any system to fit your personal trading style, psychological profile and risk preference. Get into the nitty-gritty details of system development to build your private trading system. You will learn how to customize your own position sizing, your own hedging strategy, your own trade timing, and your own scale-in strategy. •Add custom metrics via the Custom Backtester. Flesh out more robust trade results so you can compare different trading systems using customer metrics like Trade Quality. Integrate annual breakdowns of trades or annual breakdown of returns into your results. Verify that your system will perform consistently month after month and year after year, and remain robust through both good years and difficult years. •Develop your own trading model from scratch so that you can evaluate how your ideas would do under historical trading conditions. •Use some of AB’s more powerful functions. Now you can refine and improve your existing trading system, lower your risk, and improve performance. •Perform correct optimizations. Avoiding the pitfalls for “over-optimization” develop historically validated enhancements to your trading system. •Utilize multiple time frames, such as using weekly bars in a daily bar test. Further improve your system’s accuracy by trading along with short and long-term time frames. •Scale into positions. Build into your trading system, the same proprietary scaling-in methods of Connors Research’s best strategies. •Take portfolio considerations into account in your coding. Find ways to lift the performance of multiple positions in your portfolio, taking into consideration the overall performance of your portfolio.